Researchers from the Gnaraloo Turtle Conservation Program have been gathering baseline data since 2008 on sea turtle nesting activities along the Gnaraloo coastline. Project manager and environmental scientist Karen Hattingh, says before the program started there was no information about sea turtle nesting activities at Gnaraloo. 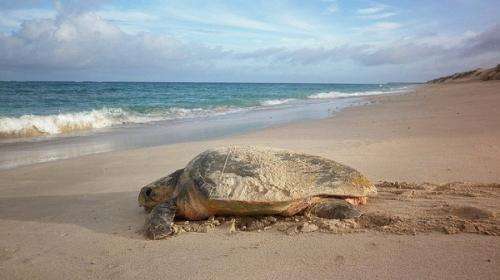 "[It] was known that there are green turtles that use Exmouth … but the Gnaraloo coastline was not widely known … for turtle nesting activities," she says. Located about 150km north of Carnarvon, the Gnaraloo coastline is part of the Ningaloo Marine Park and Ningaloo Coast World Heritage Area. The researchers have been collecting data annually from two key rookeries (breeding grounds) at Gnaraloo and found it as the largest mainland nesting site for endangered loggerheads (Caretta caretta) in WA. The 2014/13 nesting season saw the most loggerhead nests recorded at Gnaraloo, with 421 nests estimated in one of the rookeries. The previous three seasons however showed a decline in loggerhead nest numbers. "Nest numbers fluctuate from year to year which is why a minimum of a 10-year back-to-back data set is generally required to determine trend," Ms Hattingh says. This is because loggerhead females reach sexual maturity at around 30 years-old and only nest every three to four years. She says a 30-year baseline would be the best scenario. Researchers record the number of nests per species through the collection of two data sets; night monitors record sightings of nesting females; and day monitors analyse tracks for species identification and activity type. The data sets are then compared for matches and any margin of error recorded. Ms Hattingh says the methodology is the same as that used in the Ningaloo Turtle Program, run by the Department of Parks and Wildlife. "We want our research and data to translate into informed management activity that protects these areas," she says. Banning 4WDing on the beach – as it can crush turtles and nests – is one such management activity. She says it is not known exactly why loggerheads choose Gnaraloo but they seem to prefer the beaches they hatch from. "This is why it's important not to develop key nesting areas," she says. "One out of every 10,000 hatchlings on the Ningaloo coast make it to sexual maturity. "The larger the number of hatchlings that reach the water, the better for the health and recovery of the overall population worldwide." Loggerheads make up approximately 90 per cent of the turtle nesting population at Gnaraloo, with the remainder being endangered green turtles (Chelonia mydas) and critically endangered hawksbill turtles (Eretmochelys imbricata).